Modern society relies heavily upon interconnectivity. The word infrastructure is no longer restricted to traditional means of conveyance such as roads. When used in 2014 vernacular it typically refers to networks that keep our interconnected society moving at a rapid pace. In a recent Information Age discussion, the cost of data loss through a security breech was said to average US$860,273.00. Considering this fact, if the equipment for storing, processing, and transmitting this data were impaired or destroyed by fire, one can assume costs would escalate dramatically. The equipment that ensures successful completion of transactions sits in modern citadels, loosely referred to as data centres, telecom facilities, server sites, and colocation sites situated in facilities in virtually every community. IT professionals are keenly attuned to actions taken by intruders hacking into their prized networks. Faced with those risks, CIOs and IT professionals sometimes relegate the risk of fire to a lower priority. That fact, coupled with the wide range of available products could lead to them delaying the fire protection decision rather than making what they perceive to be the wrong choice. However, the fire protection industry offers a variety of solutions based specifically on the needs of our modern IT sector. Quick-acting fire extinguishment, in some cases within seconds. Does not leave residue upon discharge. Tested and approved by globally recognised testing agencies using accepted standards. Typically, systems utilising Clean Agents as described in NFPA 2001-2012 edition fall into the following three categories (see table). The higher volumetric concentration requirements of inert gas agents, along with the differing physical properties of the inert gases compared with the halocarbon and perfluorinated ketone agents has a significant impact on system design and cost. The inert gas agents cannot be compressed to the liquid state (at normal handling temperatures), and must be stored as a gas. In order to store the gases efficiently they must be compressed to much higher pressures, which necessitate the use of high pressure storage cylinders, adding cost to inert gas suppression systems. The low volumetric efficiency of the inert gas agents and their inability to be stored as liquids requires a larger number of cylinders compared with other clean agent systems. This requires additional storage space and an increased system footprint. In contrast to the inert gas systems, the halogenated and perfluorinated ketone agents can be stored as liquids, allowing for a much larger mass of agent to be stored in the same volume compared to inert gases. This significantly reduces the required number of cylinders. In addition the most widely used halocarbon and perfluorinated ketone agents can be stored in light wall low pressure cylinders and employ standard schedule 40 or equal steel pipe. Typical pressures of inert gas systems are 150 bar, 200 bar, and 300 bar, whereas halogenated and prefluorinated ketone agents are typically stored in welded seam cylinders pressurized with nitrogen to 25 bar and 35 bar, spun steel cylinders are utilized for 42 bar or 50 bar systems. For Class A, Class B, and Class C hazards the choice between an inert gas or halogenated and perfluorinated ketone agent typically involves the owner/customer, specifying engineer, authority having jurisdiction, fire protection supplier or collaboration between all parties. Where Class D hazards are involved, specific inert gases become the only choice for a total flooding agent. In an effort to be as concise as possible, we have limited our references to the most widely used products: HFC 227ea (FM-200), inert gases and perfluorinated ketone FK-5-1-12 (Novec 1230 fluid). 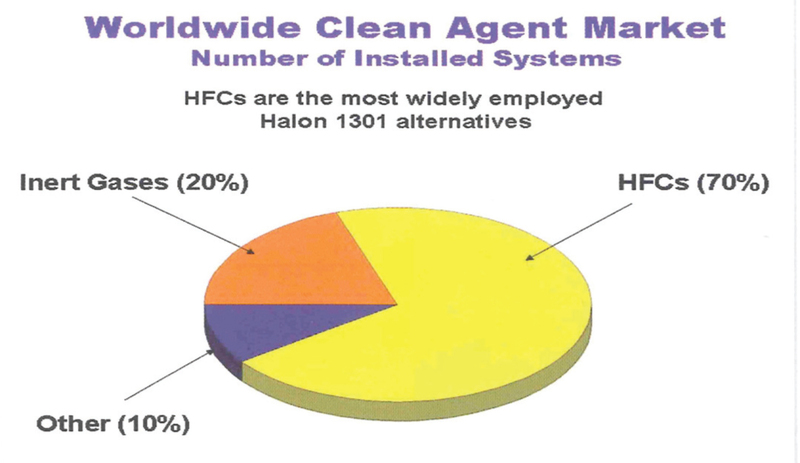 HFC 227ea (FM-200) was one of the first in a series of agents to be accepted by the U.S. EPA (Environmental Protection Agency) Significant New Alternatives Program, as a replacement for Halon 1301 in total flooding applications, and has been installed widely around the world. Fire extinguishment occurs by heat absorption removing enough heat so that the fire can no longer sustain itself. The safety factor between design concentration and LOAEL (Lowest Observable Adverse Effect Level) is 36 percent. Spot market shortages were experienced in 2012 but have been rectified and the supply of equipment and agent for new systems or recharge is currently available globally. Environmental regulations have increased costs in some regions but it is important to recognise that contributions to climate change from HFC’s in fire extinguishing applications is less than 0.01 percent based upon data from the U.S. EPA and EU-15 Countries. Regulatory bodies have been treating HFC’s in fire suppression differently than other applications where those in other industry segments, such as refrigeration, dwarf fire suppression emissions. The F-Gas regulation in Europe has adopted, supported and regulated good industry practices around filling, recharging and servicing fire extinguishing systems equipment. Inert Gas systems utilise a single gas or blends of gases to affect fire extinguishment, largely due to removal of heat and oxygen reduction. Gas blends assist in the retention of agent in the protected space by approximating the density of breathing air. Specific egress and exposure times must be followed depending upon the minimum system design concentration. The majority of systems use an orifice plate to reduce the high storage pressure of the gas to a more suitable pressure for the piping network. Pressures upstream of the main orifice are extremely high and will typically require the use of high strength materials. The manufacturer’s piping guidelines must be followed to ensure safe operation of the system. Recent cylinder valve designs regulate the flow of gas at the cylinder allowing the wider use of standard wall piping in the system. Once again the manufacturer’s guidelines must be followed. Space allocation and overall weight of cylinders is a key consideration when installing an inert gas system. If the protected space is modified, a reduction of the volume could be detrimental to the life safety due to increase of the volumetric concentration of the agent and must be reviewed by a competent fire protection professional; in addition, room pressure venting must also be provided when using any inert gas even with revisions of discharge times as outlined in paragraph 5.7.1.2 .2 of NFPA 2001, 2012 edition. The latest entrant into the global clean agent fire extinguishing systems market is FK-5-1-12 (Novec 1230). This product extinguishes fire primarily by heat absorption and has garnered wide global acceptance as it has the highest safety factor between design concentration and Lowest Observable Adverse Effect Level, 67 percent to 122 percent based upon hazard classification. 3M has increased manufacturing capacity to assure adequate supplies for new systems or recharges of existing systems. It has an extremely low Global Warming Potential of 1, very low atmospheric lifetime of five days and is included in the EPA Significant New Alternatives Program approved for total flooding systems 12/20/02. Novec 1230 [FK-5-1-12] is unique in that its vapour pressure is very low at ambient temperatures. This gives the system designer an opportunity to consider use of higher nitrogen pressures when using light wall welded seam cylinders designed to U.S. Department of Transportation standards up to nominal 34bar pressure (systems employing pressures higher than 34bar nominal may require the use of higher rated pressure cylinder). This increased nitrogen pressure and updated hydraulic calculations dramatically improves the flow of agent in piping networks associated with clean agent fire extinguishing systems. Standard wall pipe and fittings are typically used to install the systems in accordance with the manufacturer’s design manuals. Clean agent fire protection dates back to 1947 when the U.S. Army sponsored research at Purdue University in West Lafayette, Indiana to develop an extinguishing agent with low toxicity and high fire extinguishing effectiveness. That research lead to the commercialisation of Halon 1301, the production of which ceased as part of the Montreal Protocol; however, it is important to recognise that civil and military aircraft continue to rely on Halon 1301 systems in engine nacelles, cargo bays and lavatory waste bins. It is highly unlikely that even those far-sighted professionals could imagine the ways we use data in our daily lives. And yet their research provides the vision we must continue to embrace when protecting the high value assets that form the backbone of our interconnected society.